The first book in an epic fantasy series from debut author Cinda Williams Chima. Adventure, magic, war and ambition conspire to throw together an unlikely group of companions in a struggle to save their world. Han takes an amulet from one of the wizards, Micah Bayar, to prevent him from using it against them. Only later does he learn that it has an evil history-it once belonged to the Demon King, the wizard who nearly destroyed the world a millennium ago. And the Bayars will stop at nothing to get it back. Meanwhile, Princess Raisa ana'Marianna, the heir to the Gray Wolf throne of the Fells, has just spent three years of relative freedom with her father's family at Demonai Camp-riding, hunting, and working the famous Clan markets. Now court life in Fellsmarch pinches like a pair of too-small shoes. Wars are raging to the south, and threaten to spread into the high country. After a long period of quiet, the power of the Wizard Council is once again growing. The people of the Fells are starving and close to rebellion. Now more than ever, there's a need for a strong queen. But Raisa's mother Queen Marianna is weak and distracted by the handsome Gavan Bayar, High Wizard of the Fells. Raisa wants to be more than an ornament in a glittering cage. She aspires to be like Hanalea-the legendary warrior queen who killed the Demon King and saved the world. With the help of her friend, the cadet Amon Byrne, she navigates the treacherous Gray Wolf Court, hoping she can unravel the conspiracy coalescing around her before it's too late. The Demon King is a great start to the Seven Realms series and it definitely hooked me in and left me wanting more. The first book in a fantasy series always has a difficult job on it's hands, it has to balance world building with character introductions and while it's doing that it still has to include enough action to keep readers enthralled with the story. Because of that pressure I tend to be a bit more forgiving with them than I am with any other type of story but in this case I didn't really need to be. I love what we've seen of the world so far and although the characters have their flaws they are still people I can believe in and that I want to see succeed. This story is told mainly from the points of view of Princess Raisa, heir to the Gray Wolf throne, and Han, a loveable rogue from a poor background who has had to make difficult choices just to survive. The two couldn't be more different but their paths will cross in unexpected ways. It was easy to like both of these characters, Raisa has had a privileged upbringing but she is grounded by her father and the time she has spent with the Clan side of her family. She knows that eventually she will have to marry someone suitable so she is ready to take her place as queen but she hopes that is a long way off and she wants the freedom to travel and explore the world before she has to settle down. I think Raisa has the potential to be a great queen when she is a little older and wiser, she has a good head on her shoulders but at just 15 years old she is a little too impetuous and tends to rush into things without always thinking them through properly. I'm sure that is something she'll grow out of but she did have me shaking my head a couple of times while I was reading. I do love that she seems to really care about her people though - all of her people, not just the wealthy ones who attend her in court but also the everyday people who live in the towns and villages - and that is a really important in someone who will eventually be their ruler. Han never knew his father and his mother has always struggled to support him and his younger sister. He feels it is his responsibility to provide for them and he hasn't always made the best choices in how to do that but for a boy in his position crime was probably the only option he had. I loved the friendship between Han and Dancer who is a member of a powerful Clan, Dancer's family have pretty much made Han one of their own and it's through his eyes that we get to learn about Clan life. Han has tried so hard to turn over a new leaf and leave crime behind him but he's a well known face around the city and the magical silver cuffs on his wrists mark him out as an easy target for his enemies so he keeps getting drawn back in. It doesn't help that he manages to draw the attention of a powerful wizarding family when he crosses paths with the wrong person at the wrong time and now he's in more danger than ever before. I don't want to talk too much about the plot of this story because I think the whole fun of reading fantasy is getting to discover the world for yourself but I found it incredibly easy to dive into this story and I devoured it at a fairly fast pace considering how long it is. Although Raisa and Han are the main characters they aren't the only fully fleshed ones and I love how well we get to know so many of the side characters like Dancer, Bird and (my personal favourite) Amon too. There were a few things that were fairly easy to predict but at the same time there were others that surprised me so I was satisfied with the way events unfolded and the way things ended left me desperate to pick up the sequel to find out what happens next. 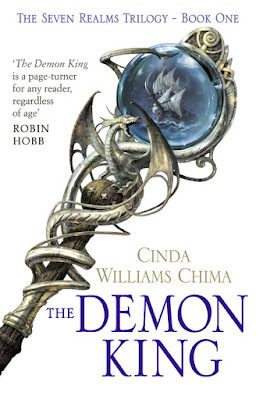 I have very high hopes for this series and I'm definitely looking forward to reading more from Cinda Chima Williams! Sounds like a great start to the series. I haven't heard of this series before, or at least I don't remember. It looks like something I might be interested in. I'm not a huge fan of YA, but I have found that fantasy YA has worked better for me than some of the other genres that I've read in YA.